Like most of us today, my life is pretty frenetic. To add to a rapidly growing business, my wife and I have two wonderful but extremely active children, Alistair, 12, and Emilie, 9, and a dog called Rafa, that absorb a lot of our time. We also have a few acres of garden, and we try to grow as much as we can for the pot. We also have a clutch of chickens and a forest full of food to forage for the table. My wife and I do try to get a moment to ourselves from time to time, but it’s not easy! I used to be pretty sporty, but to be honest I have let that slip. I get out on the bike from time to time but it is our fluffy friend Rafa that keeps me the most fit. Not having grown up with animals (my brother’s allergic), I entered into this with a bit of trepidation. But now I am smitten. A family is not complete without man’s best friend. Rafa has been a great catalyst for a number of things. Walking him on my own gives me time to muse over the plan for the day, problems to be solved or just a moment to reflect. It is also a great bonding time with the kids, or a moment of calm to share with my wife. And every time we come back we always have a bag of blackberries, a handful of mushrooms or something else from the hedgerow. We don’t need frenetic exercise to keep us fit and healthy, and a walk with the dog can be both good for the body and for the brain, something we tend to forget. If you have been reading my scribblings for a while you will know that I am a bit obsessed by food. As most of us understand, it is not easy to control your weight when there is a table full of delicacies in front of you, and the need to feed two busy kids means that we need to load the table with high carbohydrate foods just to keep their energy levels up. And I absolutely hate diets. The very concept of depriving yourself of food, or cutting out particular things, fills me with horror. I am an advocate of moderation, but unfortunately my obsession with taste can catch me out. 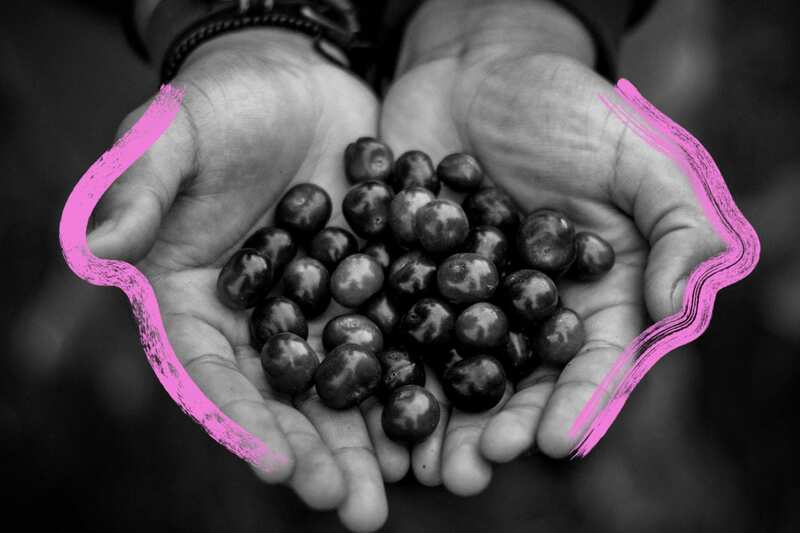 It was a recent BBC podcast of The Food Chain, focusing on the Hadza people of Tanzania (a must listen), that got me thinking more about not just how and what I eat, but also how often. The Hadza are at the boundary of hunter gatherer and early cultivators and so their diet probably closest resembles the foods that we evolved to eat. Their day generally consists of a fibre-rich breakfast, a day out hunting and foraging in which they will consume berries and roots on the hoof, finished with a hearty communal evening meal shared with the rest of the tribe. So I followed suit. My morning starts with eggs from our chickens and a piece of heavyweight, homemade bread full of fibre-rich seeds and whole grains slathered with olive oil. Most of this gives slow-release energy that keeps coming for several hours, rather than that quick carb burst that we get from commercial breakfast cereals or bread and croissants. Lunch doesn’t really exist any more. I might consume an apple or two and a banana through the day, but I am not really hungry so long as I am busy. I find that boredom tends to be a feeder and life is certainly not boring right now. Dinner is a full-on family affair, as usual. Not only has skipping lunch given me a much greater appetite but it has made me enjoy the evening meal so much more. And it means that I can (almost) keep up with my 12 year old son and eat pretty much anything I want without feeling guilty. The main point of the programme on the Hadza, however, was to look at their microbiome and how it differs to those on a typical western diet. I am fascinated by current research in this area (read I Contain Multitudes by Ed Yong as a great introduction) and the effect that improving gut health can have on short and long-term health. Incredibly, just a few days spent with the Hadza increased gut bacterial richness some 30%. Kombucha benefits: gut health to us all! We are increasingly sanitising our life and this is steadily reducing our bacterial complexity. We have already linked this to increasing allergies, but we are now beginning to understand how gut complexity can effect our propensity for longer-term and more serious illnesses. The diversity of our gut bacteria starts at an early age. We obsessively clean our kitchens, our kids are no longer allowed to play in the dirt, and we only consume heavily sanitised and often processed foodstuffs from supermarket shelves. We also pump ourselves full of antibiotics which not only kill the infecting bacterias but mess up our positive microbiome. This can’t be a good thing. One thing my wife and I encourage at home is foraging. Berries picked from the hedgerows, wild garlic from the verge and all manner of mushrooms collected in the woods carry a much wider range of bacterias than their supermarket cousins contain. Berries we eat there and then, warm from the summer sun, and mushrooms we never wash, just dusting off the earth before they are dropped into a sizzling pan. Hopefully we all benefit not just from the pleasure of their picking and eating, but also from the range of positive microbes that are invading our bodies and supporting our digestion. So, what are these kombucha benefits and how does my ongoing fascination with this ancient tea concoction fit into the picture? Why do I crave it so much after a day away? Why does it feel so good first thing in the morning? 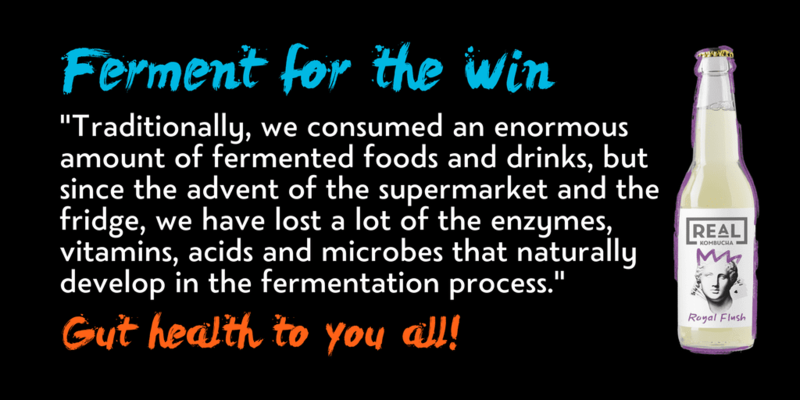 I put it down to the lack of fermented foods in our diet. Traditionally, we consumed an enormous amount of fermented foods and drinks. Whether it was beer or wine, pickled vegetables in winter, or even fruits that had fallen and just begun to be invaded by natural yeast and bacteria and fermented on the ground, we had a constant intake of fermented produce. Since the advent of the supermarket and the fridge, and then the (highly beneficial) drive to consume more fresh foods, we have substantially lost the tradition of fermentation. And in the process we have lost a lot of the enzymes, vitamins, acids and microbes that naturally develop in the fermentation process. I am a big advocate of eating more fermented foods in general and kombucha certainly helps (although it is not sufficient on its own). There aren’t kombucha benefits in every bottle you grab off the shelf, however. There are brands out there that are so weak in culture that they are not much more than a soft drink. And you should check the labels on many of the flavoured kombuchas as the addition of juices and syrups can lead to drinks that are high in sugar, so ought to be avoided except in very small quantities. 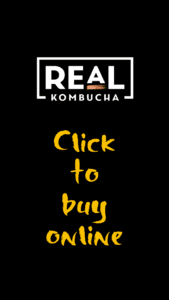 At Real Kombucha we are passionate about our fermented flavours. We never add secondary juices, syrups or other additives. Our flavours are purely a result of our teas and our particular fermentation process. We get a drink that is strong on the good bits of fermentation but under 2% sugar, so around 25-30 calories per glass (compare that to 100-150 calories for a smoothie).